Hi, I’m Jeanette Nyberg, and I can’t believe I’m still alive to post this recipe. Approximately 50% of my meals during college were 10 cent packages of ramen noodles that were made up of 90% MSG and a wavy block of delicious noodles. I’m still alive despite this 4-year diet, and I still love Asian noodles. 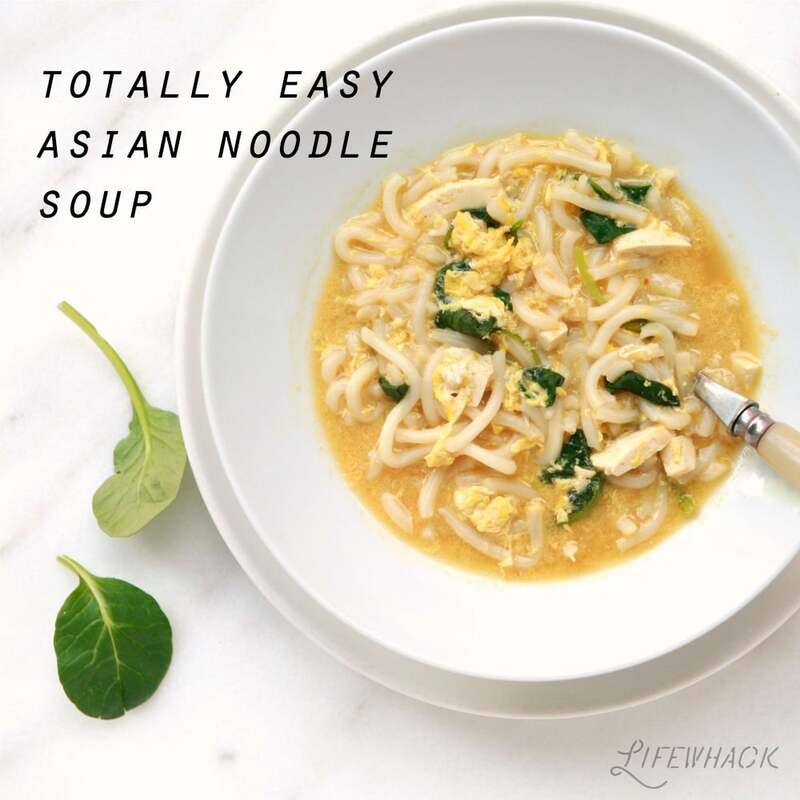 So does my 15 year old, and I’ve found a still-easy way to make Asianesque noodles that are healthy and versatile. 1 box Ramen broth – I used Imagine Organic Ramen Broth from Target and found it flavorful but not overpowering. Packaged noodles like udon or ramen. Pre-cook them if they’re dried. 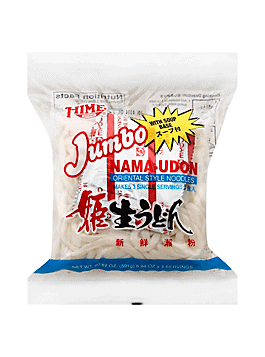 I actually used a package of jumbo Udon noodles like this one, and threw out the little packet of seasoning. Optional extras: thin sliced mushrooms, shredded carrots or zucchini, hot sauce, soy sauce, seaweed, thin sliced green onions. Okay, maybe this is more of an anything goes sort of Asian-style noodle bowl that happens to use ramen broth. Cook the noodles according to the package directions if they are dried. Heat half the box (32 oz) of ramen broth and a big handful of greens in a medium pot until almost boiling. Add in the noodles, cubed tofu (half a brick), egg, and whatever other vegetables you desire. Add more broth if it’s getting crowded in there. Simmer for 3-4 minutes, or until the noodles are all ready. Quick, healthy and versatile Asian-inspired soup for those of you who love Ramen but don't want to slowly corrode your innards. Optional extras: thin sliced mushrooms, shredded carrots or zucchini, hot sauce, soy sauce, seaweed, thin sliced green onions. Add in the noodles, cubed tofu (half a brick), egg, and whatever other vegetables you desire. Add more broth if it's getting crowded in there. You can add any thinly cut or shredded vegetables or meats you like to this soup. 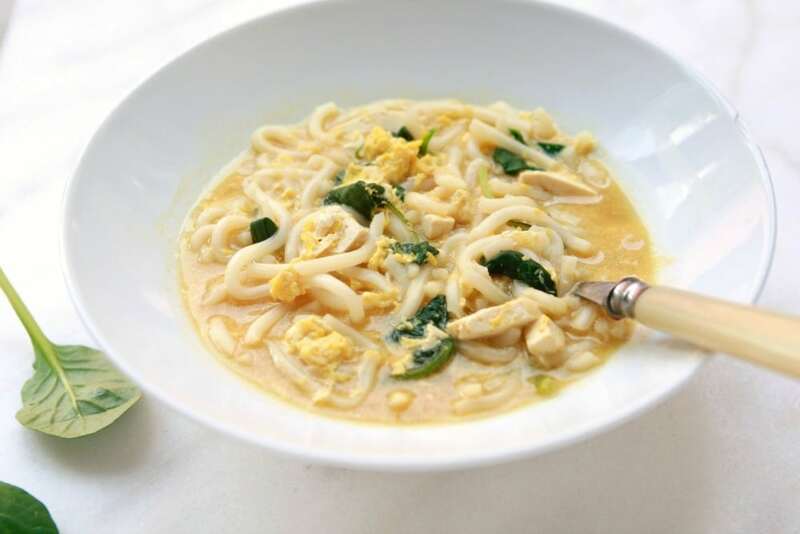 Keep some frozen on hand for whenever you want to whip up a quick batch of noodle soup.